Noolkol/Kholrabi Mor kootu is a tasty kootu prepared in Coconut gravy. Noolkol is also called as German turnip and has got loads of nutritional value. If you are Interested to know more about Noolkol and its benefits, click here. Apart from this kootu, I have tried Noolkol parathas which was a big hit among kids. 1) Heat oil in a kadai and add Mustard seeds to crackle. Next add Curry leaves and give a quick mix. 2) Now add the Noolkol, Kohlrabi and sauté for few minutes. Add enough water and close it with a lid to cook in medium flame. 3) Grind Coconut, Ginger, Green chilli and Coriander leaves to a fine paste in a mixer. 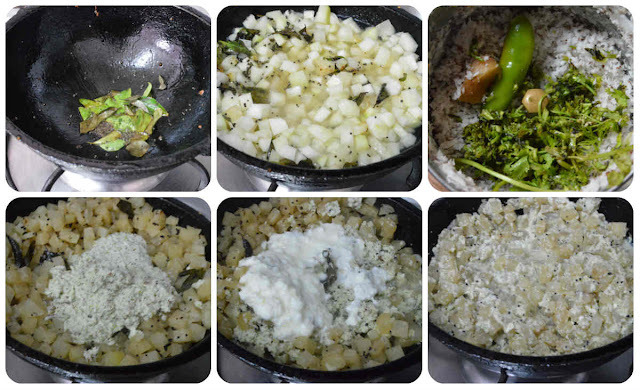 4) After Noolkol is cooked, add the ground paste, Salt and mix well. Leave to get cooked for few minutes in low flame. 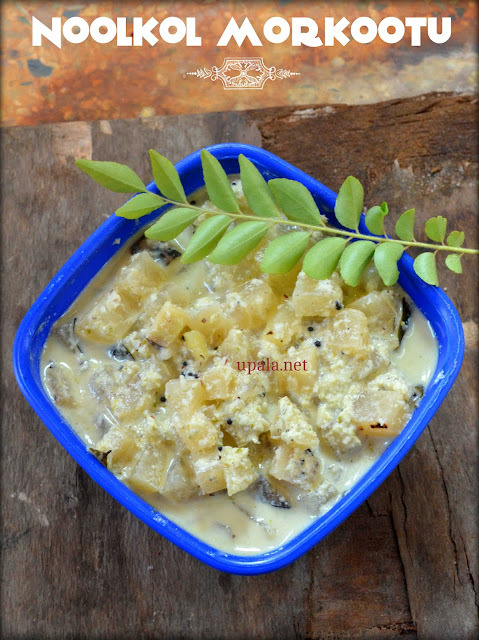 5) Next add Curd and mix well. Leave it till froth and switch off the flame as too much of boiling at this stage will curdle the kootu. Yummy Noolkol Morkootu is ready. 1) You can also skip step 1 and do the seasoning at final stage.